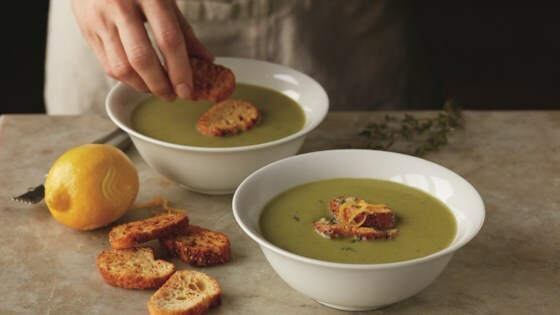 "Homemade pea soup is less than 30 minutes away, with canned sweet peas, bagged spinach and chicken broth as time savers. Blending early in the preparation so the soup purees all at once in only one batch, keeps it simple too." For Minted Sweet Pea Soup, use 1/2 cup fresh mint leaves instead of thyme in Step 2. For Tuscan Pea Soup, add 1/2 cup fresh basil instead of thyme in Step 2. Garnish with Parmesan cheese with garlic croutons in Step 3.